In 1877...Thomas Edison made his first recording of a human voice, reciting the nursery rhyme "Mary had a little lamb," on the first tinfoil cylinder phonograph. In 1923...The White House was brought fully into the modern age of communication when Calvin Coolidge (1923-1929) made the first presidential radio broadcast from 1600 Pennsylvania Avenue on this day in 1923. The next year, he made history again in by appearing in the first sound film of an American President. In 1877, President Rutherford B. Hayes (1877-1881) spoke on the telephone to the instrument’s inventor, Alexander Graham Bell. Two years later, Hayes had his own telephone in the White House, but the invention was so new that very few homes or offices in Washington had phones, so Hayes had few people to talk to. In fact, the president’s telephone number was "1". In 1957...Elvis Presley met two of his music idols, R&B singers Little Junior Parker and Bobby "Blue" Bland, while visiting Memphis radio station WDIA. In 1963...The Beatles began a tradition of releasing a spoken-word and musical message Christmas recording for fans. One such record was issued each year from 1963–1969 and a compilation of all seven in 1970. In 1971…The single "Happy Xmas (War Is Over)," credited to John & Yoko/Plastic Ono Band with the Harlem Community Choir, was released in North America. In 1980...In an interview with BBC Radio 1, John Lennon said the great thing about living in New York City was that people left him alone. iHeartMedia has announced that well known Los Angeles radio personality Sisanie has been named the new co-host of "On Air with Ryan Seacrest," effective immediately. 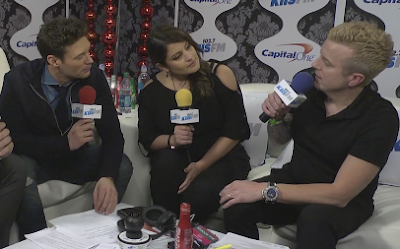 Friday evening, onstage at 102.7 KIIS FM's Jingle Ball 2015 Presented by Capital One, Ryan Seacrest made the announcement and Sisanie joined him onstage to make their first official appearance together as co-hosts. "On Air with Ryan Seacrest" broadcasts on L.A.’s No. 1 Hit Music Station - 102.7 KIIS-FM — on weekday mornings and is syndicated on 170 stations worldwide. She will also continue to serve as Music Coordinator for KIIS-FM. "I was lucky to have such a talented co-host in Ellen-K for the last 11 years, and she’s irreplaceable in so many ways,” said Ryan Seacrest, Host and Executive Producer. "Sisanie has dedicated her career to being a top radio on-air talent. She’s worked so hard and, and no matter what job they put her in at KIIS-FM over the last decade, she did it great, and with a smile. Her skill, passion and persistence have paid off in spades. She's from Orange County and has grown up listening to KIIS-FM. Like me, she fell in love with radio when she was young, and really has never looked back. I’m excited that she is joining the show as co-host, because frankly, I can’t think of anyone more qualified or who has more passion for radio and our show than Sisanie." Sisanie previously hosted her own midday show on KIIS-FM for the past 8 years and also broadcasted a midday show for KHTS-Channel 93.3, San Diego’s Hit Music Station, during that time. In addition, Sisanie has had her own national show, which was heard on more than 60 CHR radio stations including major markets such as Y100 in Miami. Born in Orange County, the bilingual, Mexican/Peruvian beauty discovered her passion for broadcasting in high school. Sisanie was only 19 years old when she started interning for iHeartMedia. She was honored by Edison Media Research in 2008 as one of its “30 under 30” after a nationwide search for 30 young bright individuals with promising careers in the radio industry. Sisanie was also the announcer for the 2014 and 2015 iHeartRadio Ultimate Pool Party which was nationally televised on The CW network, and, earlier this year, co-hosted LIVE From the Grammy Red Carpet for KTLA 5. "I grew up listening to KIIS-FM, so to be given this opportunity means everything! This is home and it’s an honor to work with the best in the industry. Thank you John Ivey and Ryan Seacrest for believing in me," said Sisanie. “I also want to thank Joe Haze and iHeartMedia San Diego for giving me my first internship which ultimately led me to my dream job!" 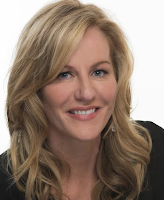 Cumulus Media and NASH’s America’s Morning Show announce that WNSH NASH FM 94.7 New York City midday personality Kelly Ford will join Blair Garner as Co-Host of America’s Morning Show and will work alongside Chuck Wicks and Robin Meade. Garner said: “Kelly is one of the most engaging personalities in radio today. 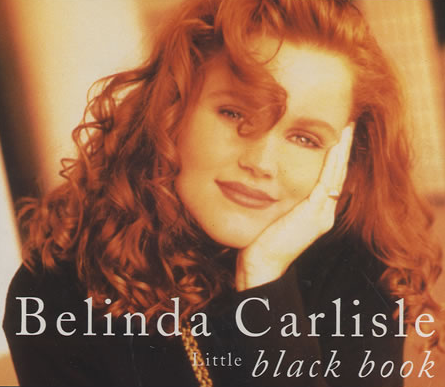 Her talent for relating to today’s Country listener is unparalleled. Real. Funny. Unpredictable. Dedicated. Coupling Kelly's qualities with the wit and humor of Chuck Wicks will make for an incredible team. We can’t wait to get her in the studio!" Current co-host Ashley Figueroa and entertainment segment host Erika Grace Powell have both left the show. 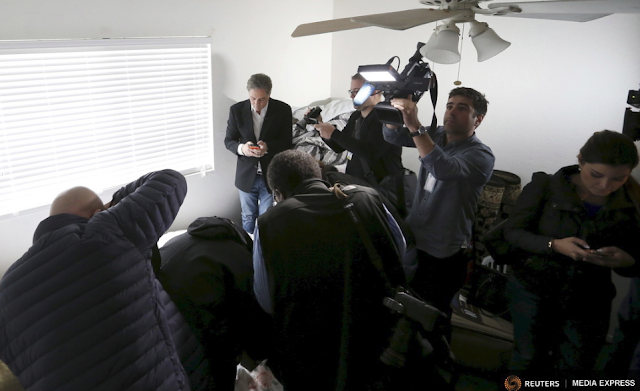 NEW YORK/SAN FRANCISCO (Reuters) - The decision by a landlord on Friday to allow news reporters into the home of the couple who massacred 14 people in California provoked outrage on social media but likely broke no laws, legal and media experts said. 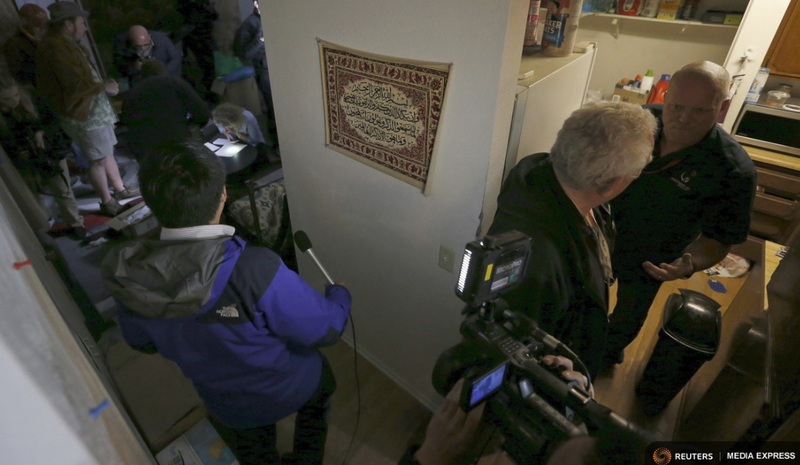 In an unusual scene carried live by major television networks, dozens of journalists, including Reuters employees, swarmed through the townhouse where Tashfeen Malik and her husband Syed Farook had lived with their six-month-old daughter. Malik, 29, and Farook, 28, were killed in a shootout with police hours after the attack at a social services agency in San Bernardino on Wednesday, during which 14 people were killed and 21 were wounded. The landlord, Doyle Miller, used a crowbar to pry away plywood that was barricading the door, and told reporters the Federal Bureau of Investigation had cleared the apartment and said he could open it. Reporters rifled through documents, picked up baby toys and thumbed through family photos, all live on television. Neighbors also appeared to freely enter the home. The townhouse contained several religious books, including a children's book called "Islamic Manners," and a tapestry on the wall bearing Arabic script. A crib with several colorful blankets and a prayer rug were inside a baby's room. Negative reaction on social media was swift and widespread. Wesley Lowery, a national security reporter for the Washington Post, on Twitter called the scene "a massive failure of two vital institutions - media and law enforcement." Mohammad Abuershaid, an attorney for the family, said they felt that the media's entry into the house was "an invasion of privacy." He said photographers and camera crews were "taking unacceptable pictures of private things in the house, such as family photos and clothing." "It was kind of like a blitz," he said, adding that the FBI "should have had better control over this house." Some questioned how agents could have finished searching the townhouse, as part of what the FBI is describing as a "federal terrorism investigation," in just 24 hours. At one point, as CNN aired live video of the apartment, the network's analyst, Harry Houck, said he had "chills down my spine" that reporters were handling potential evidence. "Now you have thousands of fingerprints all over inside of this crime scene," he said. 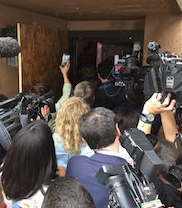 In response to Reuters, Laura Eimiller, a spokeswoman for the FBI in Los Angeles, said it was not a "crime scene" and that it was irresponsible for news organizations to suggest the agency had not taken enough time to search the townhouse. 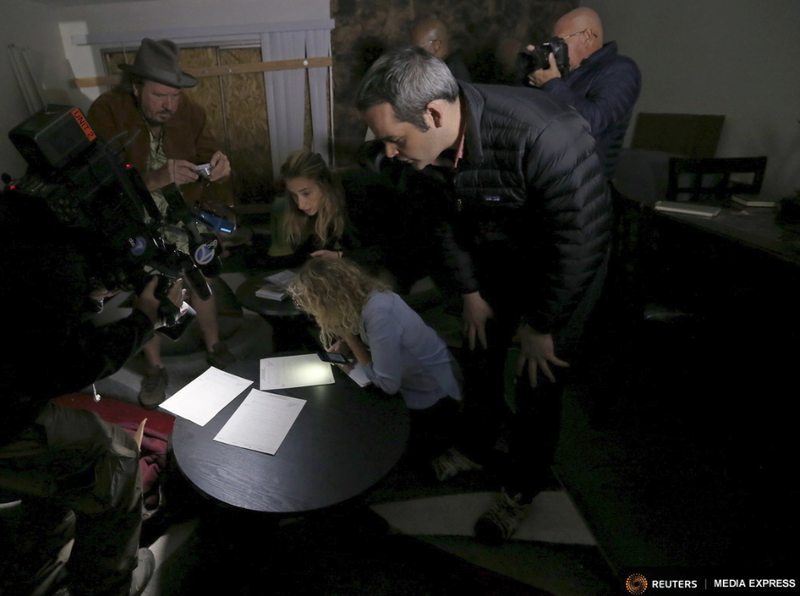 At 24 hours, the search was actually longer than the typical property search, she said. "We did a very thorough search and took our time and completed it," she said. 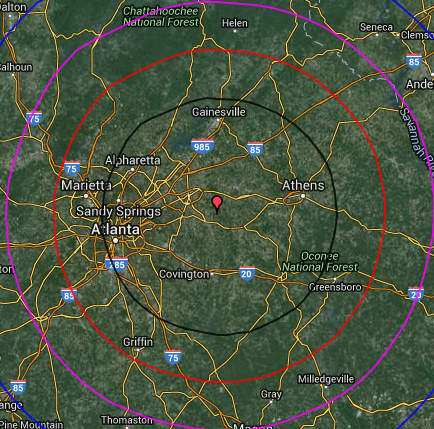 "There are cases where we need to preserve a location, but that's extremely rare." The constitution mandates that the FBI release private property to the owner once it completes its search, said Rory Little, a former U.S. Justice Department official. Representatives for local police departments, including the San Bernardino Sheriff's Department, said the FBI controlled the crime scene. Karen Carrera, a San Francisco attorney who has represented tenants, said the landlord could theoretically face legal action from the Farook estate because California law requires landlords to preserve a tenant's belongings. But, she said, it was unclear whether damages could be collected if no items were taken. Miller told reporters he allowed the media to enter but said he was surprised at how "overwhelming" the scene quickly became. News organizations likely would not be legally liable for going in with the landlord's permission, said Robert Drechsel, a professor at the University of Wisconsin School of Journalism and Mass Communication. Eugene Volokh, a law professor at the University of California in Los Angeles, said newsgathering is also exempted from state law regarding the commercial use of images. 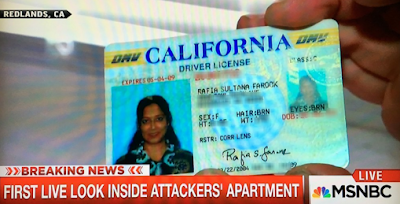 The only potential legal issue, experts said, could be showing the personal information of living people, such as the social security card and driver's license belonging to Farook's mother that MSNBC briefly displayed on camera. Regardless of the law, Dreschel said, the decision to carry live coverage while reporters examined personal items not clearly connected to the shooters, such as photographs of family members, raised ethical questions, he said. "What great new information and insight did this provide that made it so important that not only everyone rush in, in a big herd, but also put this on-air live and show personal items?" Drechsel said. MSNBC immediately began trending on social media after showing the mother's identification cards, as outraged commenters faulted the network for disregarding privacy. The network said in a statement that it had entered with permission from the landlord. And, it added, "We regret that we briefly showed images of photographs and identification cards that should not have been aired without review." A spokesman for Reuters said its journalists had entered with consent and "focused our reporting on the images and aspects of the scene that are newsworthy." Representatives for CNN and Fox News said they had permission and exercised editorial judgment in refraining from showing sensitive information such as identification cards and photographs. 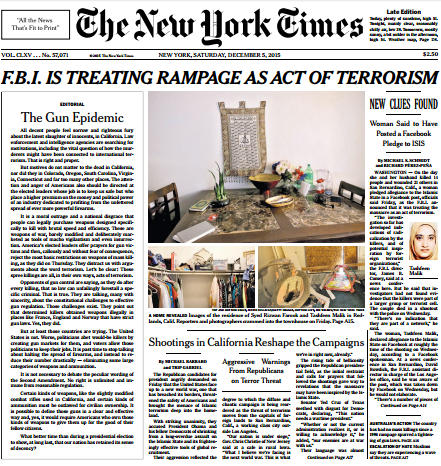 (Reuters) - The New York Times, in its first front-page editorial in nearly a century, on Saturday called for outlawing the kinds of rifles used in the California shooting massacre this week that left 14 people dead. Cumulus has announced that the NASH Next artist development competition named the Dallas-based band Breaking Southwest as grand prize winner Thursday night at the Wildhorse Saloon in Nashville, after a performance from the top 10 finalists alongside Country star Cassadee Pope. This unique competition discovers and releases music from the most promising Country talent, with the winner signed to the new NASH Next record label and the top 10 finalists all participating in a national tour next year. Country fans nominated and voted for their favorite new Country acts – with more than 450 million social media impressions in the last 3 months alone and more than 1.4 million visitors to NASHNextCountry.com. The NASH Next nationwide talent search included an extensive series of competitions that challenged contenders to showcase their musical and creative talents. This included a cover song performance, multiple songwriting competitions and the creation of an original Instagram video, a PicCollage project and a fully produced original music video. The winner was decided based on a combination of feedback from the music industry judges, online fan voting and an original “Spin Index” of social media activity. 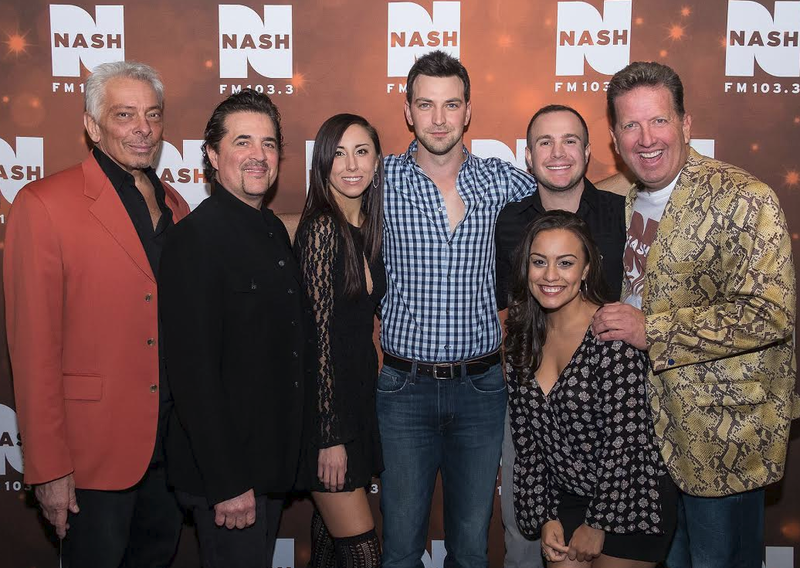 The three NASH judges included legendary music producer James Stroud, award-winning Country music artist and radio personality Kix Brooks and Cumulus Senior Vice President of Content and Programming Mike McVay. In October, Scott Borchetta, the President, CEO and Founder of Big Machine Label Group, was named as a surprise mentor, who guided the finalists through the last challenge to produce an original music video. “This innovative talent competition showed the strength of the Country music fan community. We are delighted that we were able to connect with millions of enthusiastic Country music lovers and will now be able to take 10 artists and bands on the first NASH Next tour in just a few months,” said Mike McVay, Senior Vice President of Content and Programming for Cumulus. "The entire NASH Next process has been incredible from start to finish and being the first winner is an honor. We want to thank Cumulus and NASH Next for taking this concept and making it a reality," said Breaking Southwest members Lauren Hall, Kent Bell and Kyle Gaston. "We want to thank our families, fans and friends for listening, watching, sharing and voting. Thank you for supporting us and please continue to hold us to the highest standard…We're ready to go to work!" The Nash Next Tour will begin in February 2016, and exact locations and dates will be released at a later date. Season 2 “The Voice” finalist RaeLynn, who had a top 10 Country hit “God Made Girls” and recently toured with Miranda Lambert, will also join the top 10 finalists. Her debut album is due next year. On Friday, Univision formally asked a New York judge to dismiss the $500 million lawsuit that Donald Trump filed over the Spanish broadcaster's decision to terminate a five-year, $13.5 million deal to broadcast the Miss USA pageant, according to The Hollywood Reporter. Univision decided not to move forward with Miss USA after Trump, in his June 16 presidential announcement speech, spoke about Mexican immigrants, saying, "They’re bringing drugs. They’re bringing crime. They’re rapists. And some, I assume, are good people." Today, Univision tells a judge that "through his diatribe, Trump destroyed the value of those broadcast rights, and neither Trump nor Miss Universe did anything to repair the damage in the aftermath of his speech. The widespread outrage elicited by Trump’s offensive comments was especially acute for Univision’s sponsors and predominantly Hispanic viewers, who made clear that they would not patronize a business connected with Trump." In September, Trump sold the Miss Universe Organization to WME/IMG, but retained rights to assert claims against Univision. But even if he hadn't held onto the right to sue Univision over the Miss USA deal, the Republican presidential candidate has also asserted a defamation claim over an Instagram post by Univision Networks president of programming and content Alberto Ciurana. The social media post was a side-by-side portrait of him and South Carolina shooter Charleston, S.C., shooter Dylann Roof. AM/FM radio remains the go-to choice for American consumers when driving -- and by an amazingly large margin. Today, 84% of consumers listen to regular AM/FM radio in the car, with the next largest music option being CDs at 64% and Sirius XM at 22%. Almost 75% of all audio time spent in the car is spent listening to AM/FM radio, with Sirius XM next at 14% and owned music at 11%. All streaming is just 2%. When asked, 82% of Americans say that the first thing they do when they get into their cars is turn on the radio. A recent IPSOS study estimated that 98% of consumers want an AM/FM radio with their new car purchase -- and an incredible 99% of consumers say they’re comfortable with how AM/FM radio operates in their cars, i.e. with buttons and knobs. Subramanyamin MediaVillage writes, "I’m not saying that consumers don’t love other options like apps, because they do, just not instead of radio, or to the degree of radio." Consumers have definitely spoken, and digital services are taking notice, stating right up front that they want to be like radio. 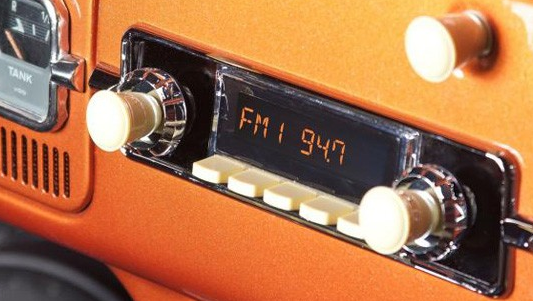 At this year’s DASH 3.0 conference focusing on “Radio & the Connected Car: A Survival Guide for Radio Broadcasters,” Pandora made it a point to say that it aspires to the simplicity of AM/FM radio. There’s a natural ease that comes with listening to your favorite broadcast station while driving that simply can’t be matched. According to Subramanyam, there’s good reason for broadcast radio’s continued popularity. It offers listeners the voices and personalities they know, love and trust. It’s the best friend sitting next to you in the car telling you everything you need to know. Radio os the original mobile medium if you go back to the core definition of mobile as “on the move,” and it’s also always been a social medium, providing listeners with the opportunity to interact with their favorite on-air personalities long before the invention of social media. Think about the call-in phone lines, which have now morphed into Twitter, Facebook, Instagram, texting and all the other ways that DJs connect to their listeners today. 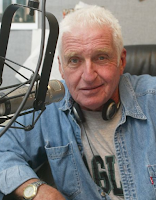 Buffalo radio legend Larry Norton, host of WGRF 96.9 FM 97 Rock’s “Norton in the Morning” program, hosted his final show on Friday, December 4. Norton announced his retirement in September over the airwaves of both 97 Rock. Norton has been broadcasting for more the 40 years. 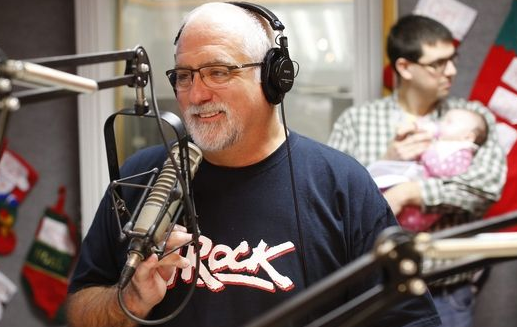 “For seven years doing the show from Florida, I worked in my boxers,” said Norton, wearing jeans and a T-shirt as he stood for his last shift in the studio at Cumulus Media Buffalo on Friday. After retirement, Norton says he plans to focus on charity and his church. During his time in Buffalo radio, Norton helped raise nearly $3 million for the Make A Wish Foundation. WIVB-TV4 reports although he is retiring, Norton promised that it will not be his last appearance on 97 Rock’s airwaves. SportsRadio 94WIP’s Wing Bowl, which has become one of the most famous annual radio events in the world, returns to the Wells Fargo Center on Friday, February 5th at 6 a.m.
Tickets for the 24th annual competitive chicken wing eating event are $10 and go on sale Tuesday, December 8 at 9 a.m. online at WingBowl24.com/Tickets and ComcastTIX.com, by calling 1-800-298-4200 or in person at Wells Fargo Center. Wing Bowl 24 is proudly presented by Steven Singer Jewelers and SugarHouse Casino. Partial proceeds from WIP’s Wing Bowl 24 will benefit the Philadelphia Fraternal Order of Police Survivor’s Fund. 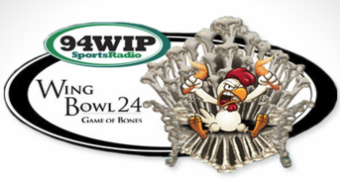 WIP’s Wing Bowl 24 will be broadcast live on WIP 94.1 FM. The contest will also be streamed live over the Internet at CBSPhilly.com as well as through the Radio.com app for a variety of mobile devices. “Game of Bones” is the theme for Wing Bowl 24. Wing Bowl is always a competition of eating. Eaters this year will compete for amazing prizes including cash, a car and a motorcycle. Eaters in Wing Bowl 24 will also have an opportunity to earn a ‘Game of Bones,’ bonus, a new and unique twist this year. The first overall contestant to win the competition and successfully eat 500 total wings will win an additional $2,000 from Steven Singer Jewelers. The first local resident to win the competition and successfully eat 400 total wings will win $2,000 from Steven Singer Jewelers. And the first college student to win the competition and successfully eat 200 total wings will win $1,000 from Steven Singer Jewelers. Money that is not awarded will be donated to the Philadelphia Fraternal Order of Police Survivors Fund. In 1901...Disney empire founder Walt Disney was born on this day in 1901. He died Dec. 15, 1966 at 65. In 1906...radio writer-producer-director William Spier was born in New York City. He is best remembered for his years producing CBS Radio’s top quality Suspense anthology dramas, and The Adventures of Sam Spade, Detective. In 1952 he created TV’s first 90-minute program Omnibus for NBC. He died May 30 1973 at age 66. In 1936...Bing Crosby takes over as host of the Kraft Music Hall radio show on NBC. 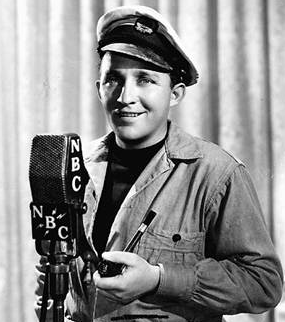 Bing Crosby was host until May 9, 1946. Other entertainers who appeared regularly during Crosby's tenure included Connie Boswell, Victor Borge, and Mary Martin. A review in Billboard magazine commented, "It is a tribute to Bing Crosby, program's highlight, that the Music Hall seems to survive all talent change -- these changes simply pointing up the fact that the show is completely dependent on Crosby." For the advertising managers at Kraft, it was imperative that advertising and entertainment be kept separate. For this reason, Kraft insisted that an announcer, not cast members, read its commercials. In 1952..Mutual Radio broadcast “The Green Hornet” for the final time. The show left the air after 15 years on Mutual, NBC and ABC. “The Green Hornet” reappeared in 1966, this time on TV. In 1955...Disc-Jockey Alan Freed's movie "Rock Rock Rock" opened to packed theatres in New York City. Rock, Rock, Rock was black-and-white motion picture featuring performances from a number of early rock 'n' roll stars, such as Chuck Berry, LaVern Baker, Teddy Randazzo, The Moonglows, The Flamingos, and The Teenagers with Frankie Lymon as lead singer. In 1967... Billboard Magazine has rated WMCA 570 AM the most influential in selling single records in New York. That doesn’t mean everything WMCA picks is going to be a hit, but there’s a good chance that it will get attention. From Billboard: During last week’s music meeting - four new records were voted on. The first was “Silent Night” by Simon and Garfunkel. This is a striking version. The duo’s singing is accompanied by a newscaster’s voice telling of rioting in Cicero (IL), of Richard Speck and the killing of the student nurses, of HUAC activities in Washington and Richard Nixon’s remarks on Vietnam. Four WMCA DJ’s present - said they loved the record. Said Joe O’Brien - “It’ll be the biggest protest song yet.” “Great Record” said Harry Harrison. “I think it’s fantastic” said Dan Daniel and Jack Spector claimed “It’s a seller.” The record was added for holiday play. The second record - “I Can’t Help Myself” by the Troggs was voted down. It was considered sexually suggestive. “Too tough” commented one DJ. The third record (and this one’s very interesting) is called “ Society’s Child ” by teenager Janice Ian. This is a song about an interracial dating. Very different. Research shows the record is a hit in Flint, Mich., Phoenix, Bakersfield and Denver and has been held over in several WMCA meetings. Ruth Meyer asks if there have been any calls? “No, but we’ve been getting a lot of postcards” said someone else. 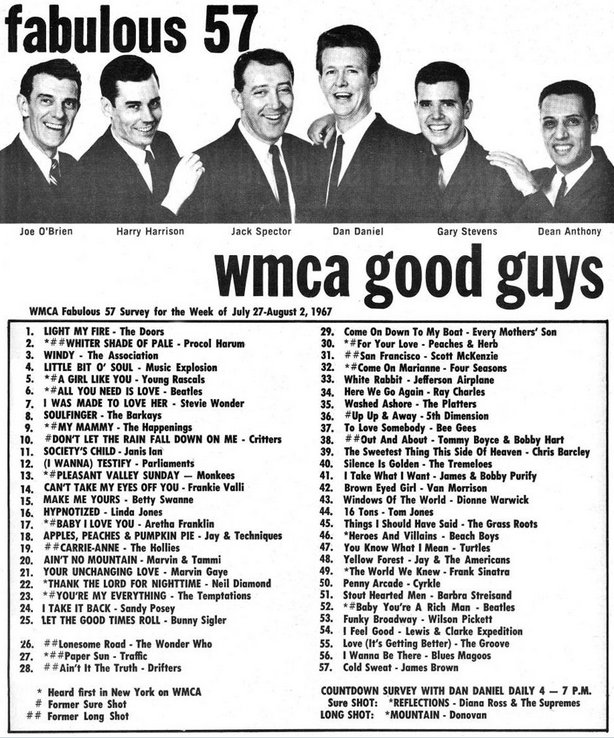 The record was not added to the WMCA playlist and will be held over. (WMCA and most top-40 stations would add the record in Spring of ‘67, after Leonard Bernstein featured Janice and the song on his March TV special.) The fourth record - “Wish You Were Here, Buddy” by Pat Boone - about a Vietnam soldier who voices a little social criticism of longhaired draft card burners back in the states. It is being held over. In 1987...The Hot 100..Former Go-Go Belinda Carlisle reached the pinnacle with her first solo effort "Heaven Is A Place On Earth". Bill Medley & Jennifer Warnes relinquished the top spot with "(I've Had) The Time Of My Life". George Michael moved to 3 with "Faith", leaping Richard Marx and "Should've Known Better". The rest of the Top 10: Whitesnake and their second hit "Is This Love", Debbie Gibson's "Shake Your Love", "We'll Be Together" by Sting, Whitney Houston roared in from 16 to 8 with "So Emotional", R.E.M. entered the list with "The One I Love" and Jody Watley grabbed #10--"Don't You Want Me". In 1987...The album Chart...Dirty Dancing kept on as the #1 album with the previous Bad from Michael Jackson still clinging to #2. Whitesnake was third while Pink Floyd peaked at #4 with A Momentary Lapse of Reason. The rest of the Top 10: Tunnel of Love from Bruce Springsteen falling to #5, The Lonesome Jubilee by John Cougar Mellencamp, Hysteria by Def Leppard was just in its infancy at #7, today was the day that Faith by George Michael climbed from 15-8 and first joined the Top 10 in its third week of release, ...Nothing Like the Sun from Sting remained at #9 and Whitney, Whitney Houston's second album, was at #10. In 2002...Roone Arledge, the pioneering TV exec who headed ABC News and ABC Sports, created Wide World of Sports, Monday Night Football, Nightline and 20/20, and was responsible for sports coverage innovations like instant replay and slow motion, died. He was 71. In 2003...Lafollette, Tennessee: DJ Jerry Monday and his wife were found dead in their home. Monday was the morning man on WLAF 1450 AM, a Gospel-formatted Radio station. In 2008...iTunes Music Store reached a new sales plateau of 300 million applications downloaded. In 2011...Monday Night Football Sports commentator/former Dallas Cowboys quarterback Don Meredith died of a brain hemorrhage at age 72. The strongest U.S. Internet regulations ever written will face their day in court on Friday, according to The Hill. Internet service providers like AT&T are hoping to have the U.S. Court of Appeals for the D.C. 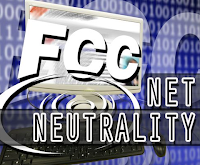 Circuit strike down the Federal Communications Commission’s (FCC) net neutrality regulations, just as it did to a pair of prior iterations of the rules. 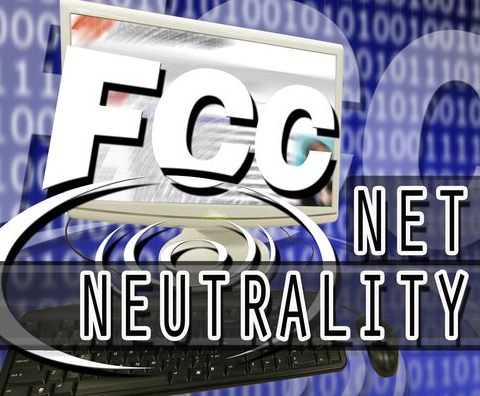 The FCC has touted the rules as a win for consumers, contending they will prevent Internet service providers from blocking, slowing or charging high prices for access to fast lanes for any piece of Internet traffic. Internet companies like Netflix, Twitter and Etsy helped push for the increased authority, in which the FCC reclassified Internet service as a telecommunications service, rather than its previous designation as a less-regulated information service. Reclassification brought with it common carrier regulations, which the FCC tailored to apply to the Internet. However, critics equate the rules with burdensome utility-style regulations. Companies like AT&T, Verizon and Comcast, who own the cables that transfer Internet traffic to and from customers’ homes, have blasted the FCC for subjecting a dynamic service like the Internet to regulations that were originally designed to regulate monopoly telephone companies. Today's oral arguments come at a time when net neutrality advocates are stoking their base ahead of a government spending debate. However unlikely, advocates have increasingly warned about a net neutrality rider slipping into the spending bill, and have encouraged supporters to inundate lawmakers' offices with calls. The crux of the arguments will focus on whether Congress left it to the FCC to determine the classification of Internet service and whether the FCC’s apparent reversal is justified by the facts on the ground. Cumulus Media Atlanta announces that Rob Stadler will join News Radio WYAY 106.7 FM as Executive Producer and host of The Morning News. Stadler will make his inaugural appearance for News Radio 106.7 as host for the “Making Miracles Marathon” on Friday, December 11, from 1:00 p.m. to 3:00 p.m. He debuts as host of The Morning News the following Wednesday, December 16, from 6:00 a.m. to 10:00 a.m.
Stadler was the voice for morning news and information on Star 94 (WSTR-FM) in Atlanta for nearly three decades. During his tenure there, he was named “Atlanta’s Best Newscaster” an impressive ten times by the Achievement in Radio Awards (AIR) while serving as the station’s News Director. Stadler earned two prestigious Edward R. Murrow awards from the Radio-TV News Directors Association for broadcast journalism excellence, and was also recognized by the Georgia Associated Press for “Best Newscast”. 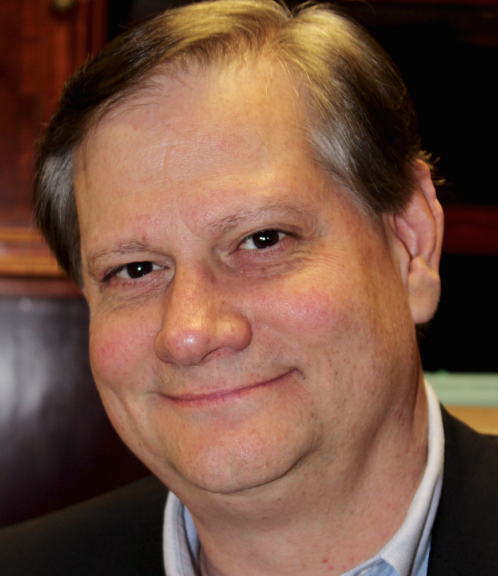 Stadler’s extensive news and information background includes News Anchor/Reporter posts at WIOD-AM in Miami and at WNCI-FM in Columbus, Ohio. He also previously served as News Director for WSNY-FM in Columbus. Cumulus Media Oklahoma City announces a trio of changes to the morning show line-up on Hot AC-formatted 98.9 KISS-FM (KYIS), 96.9 KQOB (Classic Rock) and WiLD 104.9 KKWD-FM (CHR). 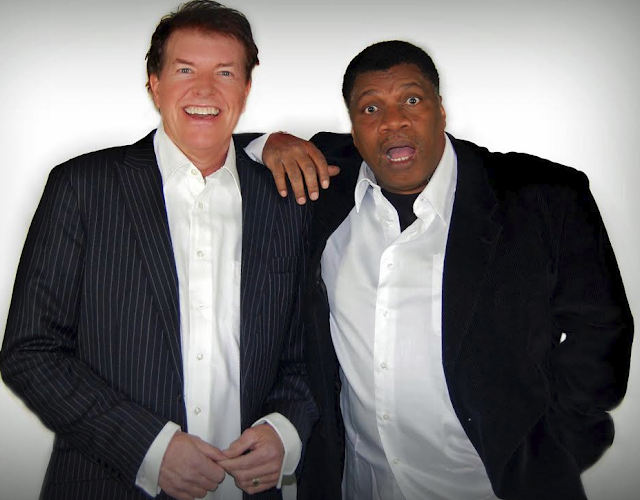 “The Jack and Ron Show”, which has aired for the last 21 years on ac KYIS 98.9 KISS-FM, made its debut Thursday in the show’s new morning spot on Classic Rock KQOB 96.9 FM , which is presently playing all Christmas music. 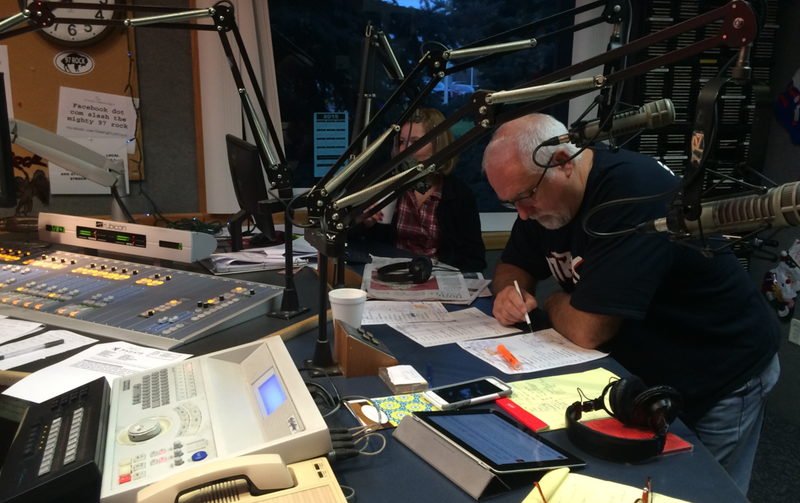 Concurrently, the long-running morning show on KKWD WiLD 104.9 FM, “The Joey and Heather Morning Show” moves to Jack and Ron’s former morning perch on 98.9 KISS-FM. 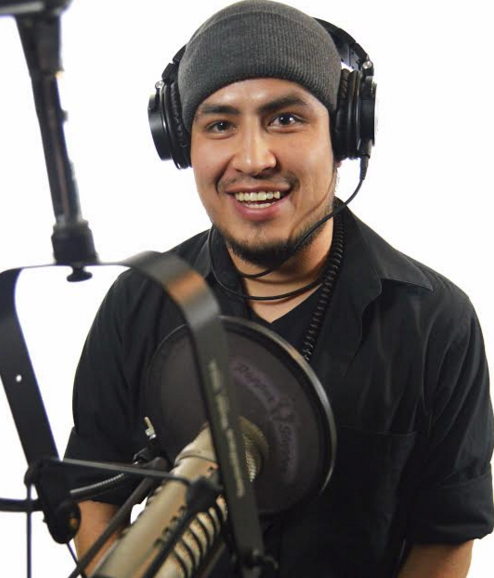 “The WiLD Wakeup with Mike in the Morning” with host Mike Ipong joins WiLD 104.9 for mornings from 6:00-10:00 a.m., and debuted Thursday in the slot formerly held by “The Joey and Heather Morning Show”. Jack and Ron (Jack Elliott and Ron Williams) are an Oklahoma City institution and have been together for 25 years as a live local team, winning 13 straight “Best of OKC” awards from the Oklahoma Gazette. 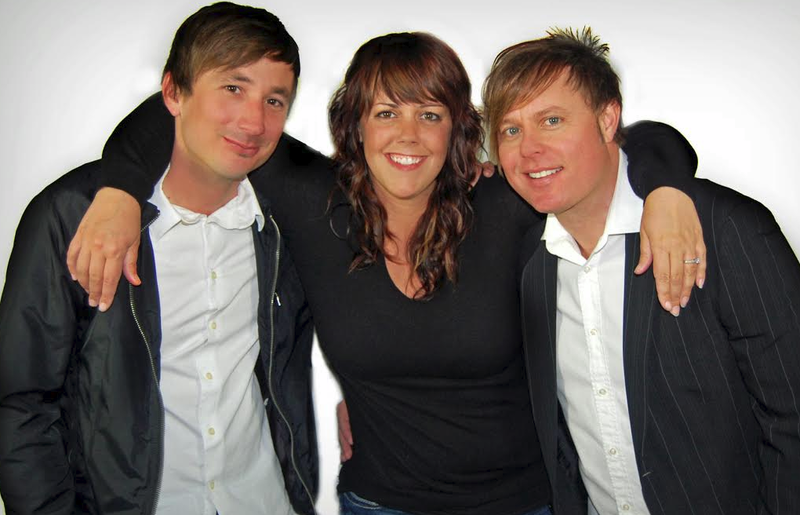 Joey Combs, Heather Potter and “Nugget the Producer” comprise “The Joey and Heather Morning Show”, a morning staple on OKC airwaves for the last 15 years. Mike Ipong was formerly Traffic Reporter for all Cumulus Media Oklahoma City morning shows, was midday host on WilD 104.9, and also produced “The Jack and Ron Show” on 98.9 KISS-FM. USA Radio Networks To Launch "Trending Today"
USA Radio Networks has announced the launching of "Trending Today USA" hosted by radio talk veteran Rusy Humphries. Humphries is also Senior VP/Programming. The show will focus on the social buzz. Rusty Humphries currently hosts the Rusty Humphries Rebellion podcast at the Washington Times. The program focuses on political issues, personalities, and comment. About the Trending Today USA program now in development, Humphries said he is more proud of it than anything else he has done in radio. Its thesis is that consumers are consuming more news than ever, but doing it on social platforms. Acting as a barometer and curator of trending buzz therefore puts radio where the listeners are, as a dynamic and relevant destination. Curating virality is big business. Buzzfeed, Reddit, and other sites use different methods of producing socially distributed news, from crowdsourcing to original journalism. Traditional newsrooms like Fox and CNN produce “trending now” sections. In music, Spotify, YouTube, and most other on-demand services issue viral/trending playlists. 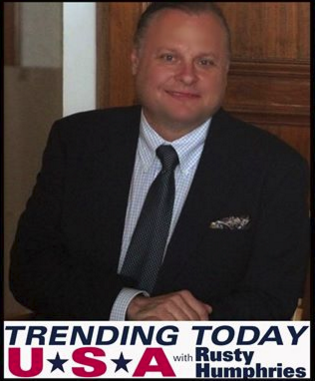 Humphries is putting radio, a real-time medium, into the “trending now” mix as a bet that traditional over-the-air broadcast can be as fast and whip-smart as the speedy online platforms. 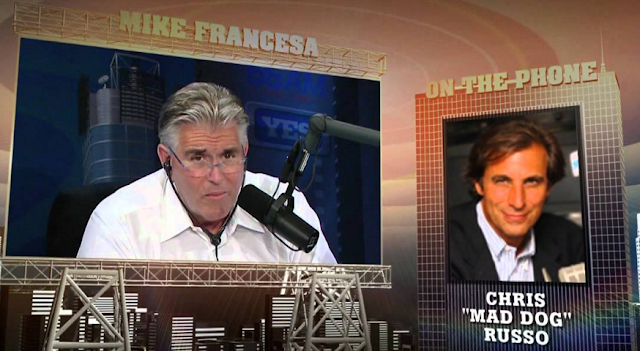 Fans have been clamoring for a Mike Francesa and Chris Russo reunion almost since the day they broke up seven years ago. On March 30, they finally will get their wish. Francesa and Russo announced during a joint, commercial-free, 40-minute appearance on WFAN 660 AM / 101.9 FM and SiriusXM Satellite Radio Thursday that “Mike and the Mad Dog” will reunite for a one-time-only fundraising show at Radio City Music Hall. Proceeds will go to The Garden of Dreams Foundation, which benefits programs and charities that help children facing various obstacles, including physical and financial. Francesa and Russo, who were partners on WFAN for 19 years before breaking up when Russo left for SiriusXM, said they were approached by Madison Square Garden officials, including executive chairman James Dolan, and agreed to do the show together. Francesa said the tickets would start at $50 and include more expensive options with perks such as a meet-and-greet with the stars. Although tickets are not yet on sale, Francesa said fans could reserve them at RadioCity.com/gardenofdreams. Shortly thereafter, that site crashed, presumably from volume. Minutes after the announcement the term “Mike and the Mad Dog” was trending nationally on Twitter. Francesa said the Garden would handle all expenses associated with the event, allowing 100 percent of proceeds to benefit the foundation. He said the show would run up to 2 ½ hours without a break and feature big-name guests that are yet to be announced. Newsday reports Francesa said he and Russo got permission from both of their companies to work together and from CBS Radio to use the name of the old show. He said they would make several joint appearances in the coming months – both on the radio and in person – to promote the event. Townsquare Media New Jersey has announced that Bob Levy, morning host for News Talk Radio WOBM 1160 AM & 1310 AM will enter into semi-retirement and step down from the ‘Bob & Marianne in the Morning’ program after 18 years. The original Sales Manager for sister station WOBM 92.7 FM, Levy also went on to serve as the Sports Director, General Manager and well known on-air personality with his show ‘Topic A’, one of Ocean County’s most listened to shows since 1979. 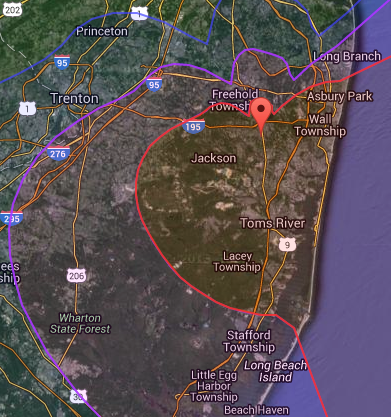 In 2012, Levy was inducted as a charter member into the New Jersey Broadcasters Association Hall of Fame. Levy is also a member of the Lakewood High School Hall of Fame and is the namesake of the Bob Levy Broadcast Center where all of Townsquare Media New Jersey Shore stations operate – a tribute to his years of dedicated service. Bob will remain with Townsquare Media and retain his duties as host of ‘Topic A’ on News Talk Radio WOBM-AM 1160 & 1310 and 92.7 WOBM, a show he has hosted for the past 36 years every Sunday from 7AM-11AM. Levy’s wife and co-host Marianne Levy will transition from ‘Bob & Marianne in the Morning’ to ‘Preferred Company with Joel Markel’, a show she has also been co-hosting for the past 3 years. That program will expand from one hour to two and will air weekdays from 8:00AM-10:00AM. Townsquare Media also announced the addition of a brand new show: ‘Wake Up With Jeremy Grunin’, hosted by Toms River native, business, civic and non-profit community leader Jeremy Grunin. The program will focus on issues and events happening at the Jersey Shore and will air weekdays from 5:30AM-8:00AM. “Taking over a time slot previously held by a radio icon like Bob Levy and leading in to another local legend like Marianne Levy is a daunting task. I can’t begin to replace what they have given to listeners for so many years, but rather hope to bring a different point of view and flavor to the WOBM listening audience”, Grunin commented. The final ‘Bob & Marianne in the Morning’ program will be on Friday, December 18th with the new programming schedule set to begin on Monday, January 4th. Entercom Seattle’s KKWF 100.7 FM The Wolf Fitz In The Morning host Fitz has once again been named “Best Local Radio Personality” by KING-TV’s Evening Magazine “Best of Western Washington” competition. Fitz’s show was recently added to sister station KWJJ 99.5 The Wolf in Portland and the radio personality is also the host of the nationally syndicated Powered By Country, a weekend countdown show. Bill O’Reilly confronted Donald Trump tonight over his 9/11 “cheering” claim after he fact-checked it and found insufficient evidence to back him up, reports Mediaite. 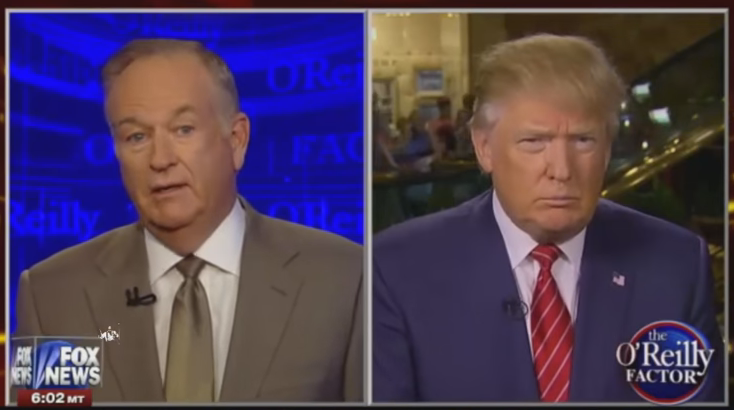 There was one local WCBS-TV2 news report about individuals in New Jersey cheering that was flagged by authorities, but O’Reilly told Trump there’s nothing to bolster “thousands.” He told Trump that was “wrong,” but said of course celebrations did occur. Trump repeatedly defended himself by citing a Breitbart article declaring Trump to be “100% vindicated.” That article says based on one line in a news report about an apartment building “swarming with suspects,” combined with a few other reports, you can easily get to the “thousands” Trump claimed (the writer of that piece apologized for initially doubting Trump). 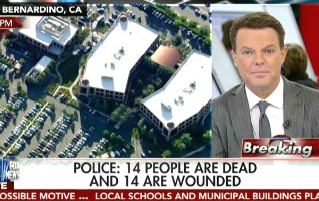 Cable news networks clocked enormous ratings increases yesterday when a married couple gunned down 14 at a holiday party in San Bernardino, California, killing 14 and injuring another 21, fled in an SUV and died in a hail of bullets when police caught up to them. According to deadline.com, across 2 PM ET Wednesday to 1 AM thursday, over which time the drama and careful investigation of the killers’ house unspooled, Fox News Channel logged an average of 3.8M viewers. That audience is 129% bigger than the network experienced same day last week on Wednesday across those hours. CNN, meanwhile, logged a whooping 280% increase, to 2.6M viewers, compared to the previous Wednesday. MSNBC averaged 1M viewers across those hours, a 111% increase vs. same day, same hours last week. Meanwhile, among all cable networks for the week of Nov. 23-29, Hallmark Channel ranked No. 2 in primetime total viewers (all-time high 2.48 million), behind only ESPN (3.45 million), and No. 1 in its target women 25-54 demo (516,000 or a 0.86 rating). It also placed No. 6 in adults 18-49 (517,000 or 0.41 rating) and No. 3 in women 18-49 (385,000 or 0.60 rating). In addition to the five new telepics, Hallmark also loaded up its week with encores of other original holiday movies, reports Variety. 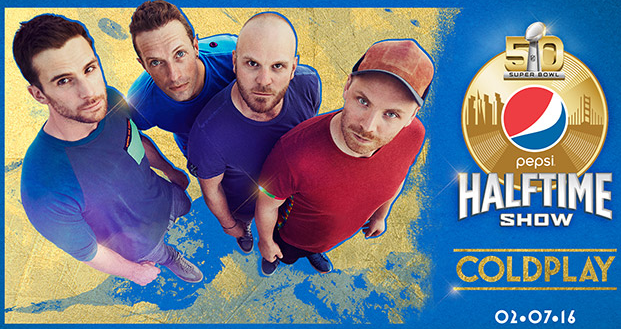 Global superstars Coldplay, winners of seven Grammy Awards, will perform at the PEPSI SUPER BOWL 50 HALFTIME SHOW on CBS Sunday, Feb. 7, 2016, the NFL announced Thursday during halftime of the Thursday Night Football game between the Green Bay Packers and Detroit Lions on CBS and NFL Network. 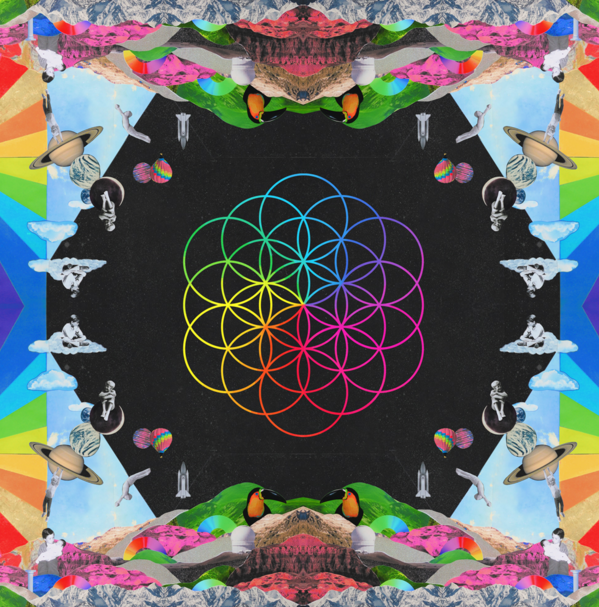 According to the NGL, Coldplay front man Chris Martin is designing a show that will echo elements of the NFL's On the Fifty campaign -- honoring the past, recognizing the present and looking ahead to the next 50 years, including other special artists. For the first-time ever, Pepsi will give fans behind-the-scenes access to how this monumental show will come together at Pepsi.com. 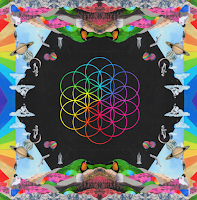 Today, Dec. 4, the band releases their highly anticipated widescreen seventh album, A Head Full Of Dreams -- available worldwide for fans to download on iTunes. Country star Blake Shelton co-hosts this weekend’s edition of Country Countdown USA, the second of a special two-week edition. 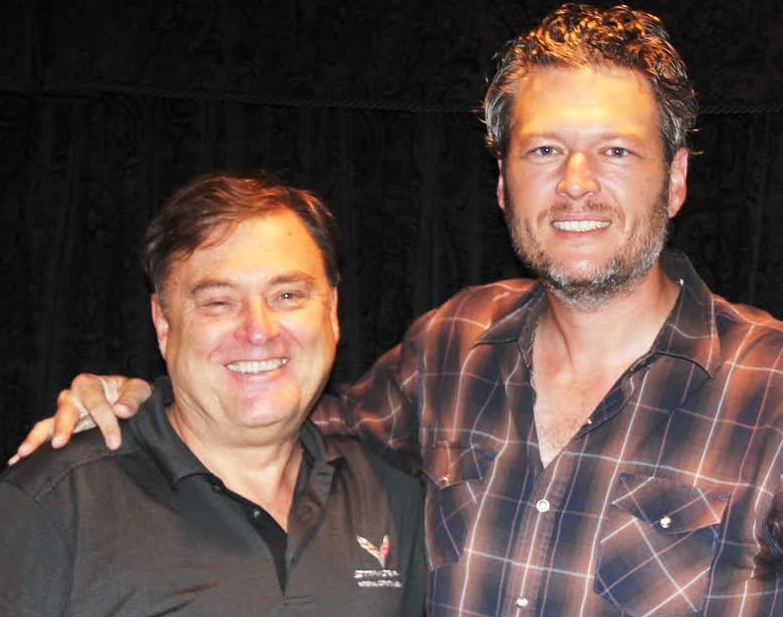 Shelton talked to Lon Helton about why 2015 has been both the worst and best year of his life. He also reveals who he stayed with while he was going through his divorce. Plus, Shelton mentions what's been consuming all his time and energy during the past year. (Reuters) -- Rock singer Scott Weiland, the troubled ex-frontman for the band Stone Temple Pilots, died during a tour stop with his new band the Wildabouts in Minnesota, according to a statement posted to his Facebook page late on Thursday. 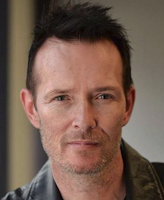 Weiland, 48, died in his sleep while on tour in Bloomington, south of Minneapolis, according to the statement. His death also was reported by TMZ.com and Billboard. The California-born singer, who had acknowledged a long history of substance abuse, was kicked out of Stone Temple Pilots in 2013 for what his bandmates' attorney called "destructive behavior." He also performed with the group Velvet Revolver for a number of years. Weiland, known for his growling vocals and shock of dyed red hair, came to symbolize the early 1990s grunge era as lead singer and lyricist for the Stone Temple Pilots. Adept at altering his vocal style, he sometimes sang through a megaphone at concerts. Weiland's Facebook page gave no details about the circumstances of his death. Bloomington police said in a statement they received a call reporting an unresponsive man in a recreational vehicle on Thursday night and that officers who went to the site found he was dead. Police withheld the man's name, pending an investigation by the Hennepin County Medical Examiner's Office and the local Sheriff's Office. Stone Temple Pilots, also known as STP, was co-founded by Weiland in the late 1980s and went on to score such guitar-heavy hits as "Plush" in 1993 and "Interstate Love Song" the following year. The band broke up in 2003 but reunited five years later only to collapse in acrimony again in February 2013 when Weiland's bandmates - Dean DeLeo, Robert DeLeo and Eric Kretz - forced him out. AdWeek Names Fox' Roger Ailes "Media Visionary"